Hi friends! It's good to be back! I've posted a couple times in the last few weeks but I haven't reeeeally been around. We've been in Michigan visiting family and having an all-around good time. It was great! Can I just say that I am in love with Michigan? Folks, I was waking up to 63 degree weather IN JULY. That alone might be worth 5 months straight of White Christmas. And with the trees and hills, it's just gorgeous and green. Except for those two inch mosquitos. I totally could have gone the rest of my life without seeing those. But you want to know what else is great about Michigan? This state has wild turkeys in abundance. In the rural areas, you can find tons of turkey feathers just lying around. Sometimes you get to see the turkeys themselves. This trip, I got to see a whole group of them, including a hen with a little chick hiding in a field. So cute! 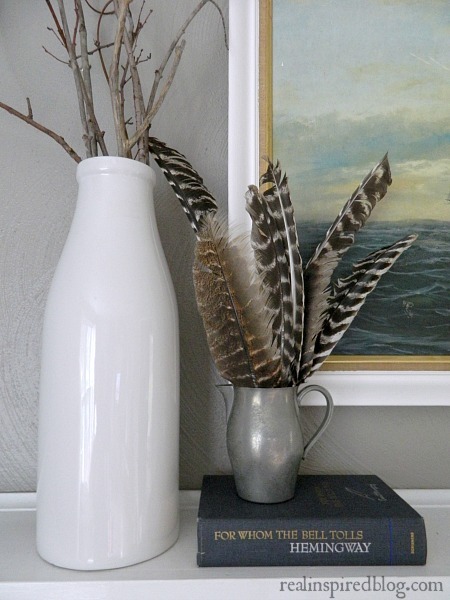 I have always had a thing for birds and feathers so of course I snatched up all the feathers I could find! Now they have found a home on my mantel. 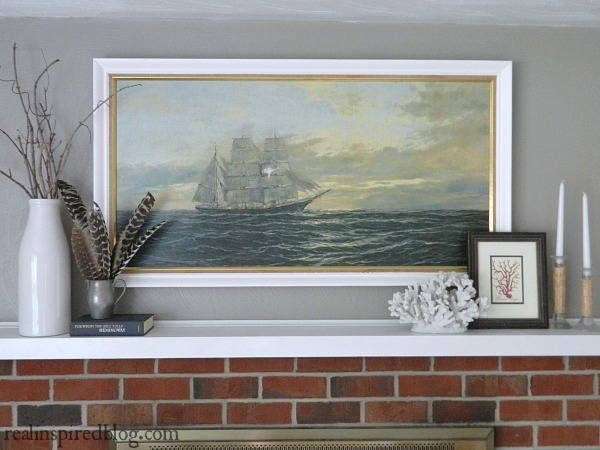 I shared my summer mantel a few weeks ago and I still felt that it just wasn't quite finished. The feathers add so much to it! I'm trying so hard to decorate with what I love, what truly inspires me, and that is nature. 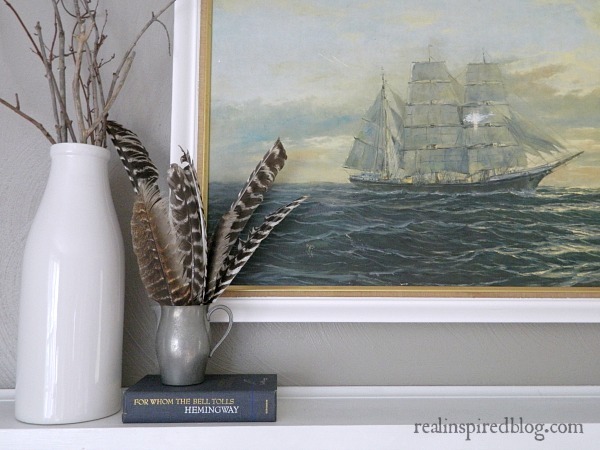 Whether it's a ship on the ocean, a sand dollar on a beach, a tree stump on the side of the road, or turkey feathers in the woods, I'm working on blending them together seamlessly in my home. I firmly stand behind the familiar "use what you love" phrase, but working out the how in real life is a little trickier. I think a lot of it is editing. Making use of "white space." You can't just throw everything together and have it work. You have to add and subtract, sometimes ruthlessly, before you happen upon an arrangement that works. I guess you could call it "Creative Discernment." It's basically just a fancy way of saying "throw some feathers in a little pitcher and hope it works."